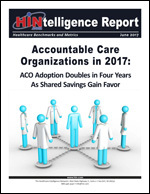 White Paper Abstract: Accountable care organization (ACO) adoption has more than doubled in four years, from 34 to 71 percent, according to 2017 ACO metrics from the Healthcare Intelligence Network. Over that same period, the percentage of ACOs using a shared savings model for provider reimbursement rose from 22 to 33 percent. Of available ACO initiatives, the Medicare Shared Savings Program (MSSP) remains the favorite, with MSSP participation hovering at around 66 percent, a metric unchanged since HIN's 2013 ACO snapshot. Looking ahead to 2018 ACO models, 24 percent will participate in the Medicare ACO Track 1+ Model, a payment design that incorporates more limited downside risk. In other trends identified by the May 2017 Accountable Care Organization survey, HIN’s fourth comprehensive ACO assessment, ACO administration has shifted from physician-hospital organizations in recent years to integrated delivery systems (IDS). More than one-quarter—27 percent—of 2017 respondents report that an IDS helms their ACO. Download this HINtelligence report for more data on ACO covered lives, ACO challenges and measures of ACO success.